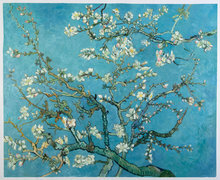 A shining example of Van Gogh’s attraction towards traditional Japanese woodblock prints. This is the Dutch painting legend’s version of Utagawa Hiroshige’s Sudden Shower over Shin-Ōhashi and Atake. "I was very wary of buying reproductions of fine art on the Internet and did a lot of research before buying. I am thrilled with the three paintings that I have bought from Van Gogh Studio. I was so happy with the first one (Japonaiserie Bridge in the Rain), that I bought two more (Japonaiserie Flowering Plum Tree and Blossoming Almond Tree). The customer service that Erik provides is superb. He responds promptly and helpfully to all inquiries.The paintings arrive very quickly (three days from Amsterdam to NYC) in very practical sleeves. They are beautifully painted and receive much admiration from guests. They blend with my other paintings which are genuine (but not by famous painters) to create a very good effect. - Miriam Blech"
Nature scenes and depictions of everyday life in Japanese prints greatly fascinated Van Gogh during his stay in Paris. This was a stark contrast from any work that he had done as a painter. Our Dutch and world artists who will recreate your own copy of this artistic masterpiece have studied Van Gogh’s techniques in great detail. With attention to his unique brushstrokes and colour schemes, we can deliver a piece that is very close to what Holland’s most revered artist had originally created. Coined by Jules Claretie in his book L’Art Francais, Japonaiseris is a french term that refers to the enthusiasm of Japanese Art and the way it influenced artists in the West. 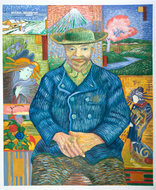 Vincent Van Gogh was no stranger to traditional Japanese woodblock printing. 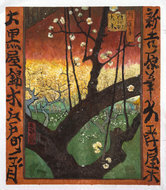 He had collected numerous Japanese prints from art dealers in and around Paris and used to study them in great detail. There was a certain allure that lay in the use of intricate patterns, colour, and flat perspectives of Japanese art. Apart from Van Gogh, artists like Monet and Degas were also heavily influenced by these woodblock prints. This piece was painted by Van Gogh on canvas. 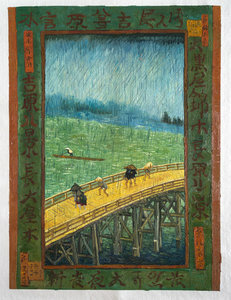 However, to retain the proportions of the original art by Hiroshige, Van Gogh had to add a border which consisted of a few letters from Japanese. The colours used by Van Gogh are also a little more vibrant than the original. The predominantly grey background gets replaced with green water, a blue sky, and pale pink bridge supports. As for the lines and brushstrokes, Van Gogh ditched the strong overtones of Hiroshige for soft strokes which depict the mistiness of the rain. 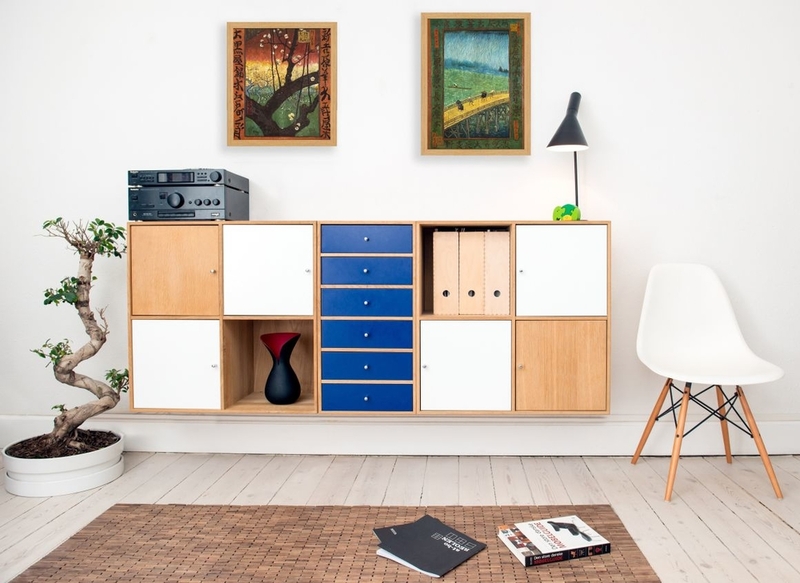 Posters or prints won’t create special beauty in your home, no matter how exquisitely furnished it is. Buy this masterpiece in oil on canvas to improve the aesthetics of your home or office. Painting received. Fantastic peace of art, excellent service. I will definitely be a returning customer. Many thanks. I was very wary of buying reproductions of fine art on the Internet and did a lot of research before buying. 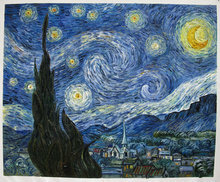 I am thrilled with the three paintings that I have bought from Van Gogh Studio. I was so happy with the first one (Japonaiserie Bridge in the Rain), that I bought two more (Japonaiserie Flowering Plum Tree and Blossoming Almond Tree). The customer service that Erik provides is superb. He responds promptly and helpfully to all inquiries.The paintings arrive very quickly (three days from Amsterdam to NYC) in very practical sleeves. They are beautifully painted and receive much admiration from guests. They blend with my other paintings which are genuine (but not by famous painters) to create a very good effect.